Split Grip: Can Separating Your Hands Improve Your Putting? There are many ways to hold your putter. A split grip is most commonly used on the long putter where each hand performs a different role. A gap between your hands, however small, is said to increase the control over your putter and allow you to putt with greater accuracy. It was used as early as the nineteenth century so the idea that it is something new is wrong. The reverse-overlap grip, a variation of the Vardon grip, has for years been the accepted way to hold your putter. It is a grip that has stood the test of time, but it is coming more under scrutiny. Should you be overlapping your hands on the putter shaft? Is it the best grip for short pressure putts? Golf like other sports such as hockey, baseball, and cricket is a two-handed game. Yet it is only in golf that your hands are somehow linked. In the other sports your hands are separated on the grip. With the long putter it is necessary to separate your hands, allowing each hand to perform a different role. The left hand steadies the putter shaft against your body while your right hand guides the putter. The question is: Should the separation of task be applied to the standard length putter as well? In 1920 Willie Park in his book The Art of Putting wrote "The putter is held with both hands, but all the hitting should be done with one hand … If both hands are used, the one works against the other, and the result is not satisfactory." Paul Trevillion, a commercial artist in England, advertised in Golf Illustrated in January 1970 that he was the world's greatest putter. He lay claim to have invented the split-hand putting method which he explained in his book The Perfect Putting Method. 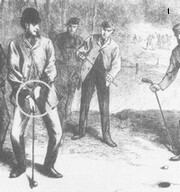 His technique was to bend low over the ball with a shortened putter and position his right hand down the shaft towards the putter head. In January 2004 at the PGA Show the HammY putter was launched. It is a center-shafted putter with a triple bent shaft. Similar to Trevillion's method, your hands are spread in the same way as you would hold a hockey stick. The marketing rationale behind the HammY states that the hand position a person uses to hit a home run in baseball and drive a golf ball are similar. While this hand position is effective for maximising distance, it severely minimises your control and accuracy. Baseball players bunt with an open stance and spread hands for control and accuracy. Why then, do golfers insist on using the same grip to drive a ball 300 yards, as they do to putt it three yards? Should you experiment with a split grip or should you stay with the more conventional approach of overlapping your hands? Perhaps it is worth a try if you feel the need to improve your putting.